Ever wondered how different parts of the eye work? Action for Blind People provides some useful information for you to share with your colleagues and clients. The eye is made up of different parts, which are all vital for vision. As light passes into the eye through the cornea, the iris opens the pupil depending on how much light there is. The light is then focused by the lens on the retina at the back of the eye. This light is transformed into electrical signals by the cells in the retina and passes through the optic nerve into the brain. These electrical signals are then processed into an image by different parts of our brain. All parts of the brain and eye need to be present and working for us to see normally. The choroid is the layer of blood vessels and connective tissue between the sclera and the retina. The choroid provides oxygen and nutrients to the retina. The macula and optic nerve are dependent upon blood supply from the choroid. Cones are photoreceptor (light sensitive) cells. 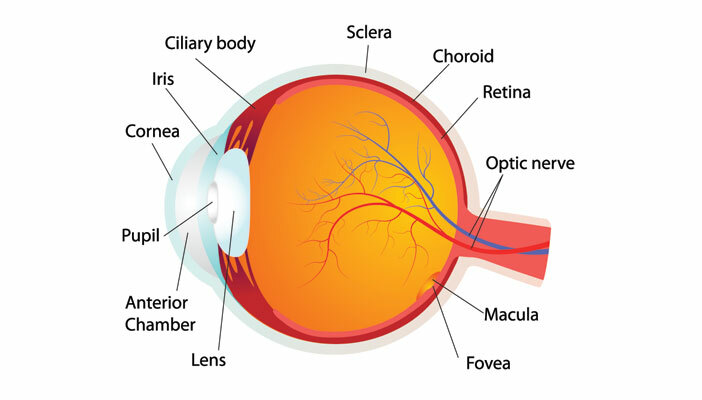 The retina has approximately six million cones, in the macula, which is the area accounting for central vision. Cones are essential for sharp vision, working best in bright light and letting the eye see colour, which is why we see colours less accurately when it is darker. At the front of the eye is the protective part of the eye, the cornea, which covers the iris and pupil at the front. The cornea and the lens refract light so the eye can focus. The cornea is transparent and does not have blood vessels; it needs oxygen directly from the air. If something touches the cornea, the eyelid will involuntarily close. Astigmatism, short and long sightedness can be caused if the shape of the cornea is not as curved as it should be. Corrective eye surgery uses techniques to reshape the cornea to reducing the need for glasses. The fovea is in the centre of the macula and contains most of the cone cells. The fovea is responsible for sharp central vision, necessary in any activity where visual detail is important, such as for reading or watching television. The iris is the coloured part of the eye, which is blue, brown, green, grey, black or hazel, depending how much melanin (pigment) they contain. The iris controls the diameter and size of the pupil and the amount of light that reaches the retina. The iris can make the pupil smaller or bigger, depending on how much light is entering the eye, similar to how an aperture on a camera works. The lens is the transparent part of the eye that refracts light so it is focused on the retina. The lens can change shape allowing the eye to focus on objects at different distances. The lens becomes thicker with age and can not change shape so easily, which is why as we become older it may be more difficult to focus on close objects without reading glasses. The lens might also become larger and cloudier with age, which is known as cataracts. The macula is an oval, highly pigmented spot near the centre of the retina at the back of the eye and is responsible for central vision. The macula is yellow and absorbs excess blue and ultraviolet (UV) light that enters the eye. The macula contains a high density of cones and is needed for accurate and central vision. Melanin is a dark pigment in the tissue of the iris, which also determines skin and hair colour. The melanin in the eye helps the choroid limit uncontrolled reflection within the eye. People who are albino have low levels of melanin and vision is low. The optic nerve is a collection of communication wires which convey information from the retina in the eye to the brain. Our “blind spot” is due to a lack of retina where the optic nerve leaves the eye. The pupil is an opening in the iris and appears as a black, round circle in the middle of the eye. It looks black because most of the light is absorbed by the tissues inside the eye. The pupil acts as the eye’s aperture, allowing more or less light into the eye. If bright light is shone into the eye, the iris muscles contract and reduce the size of the pupil, in low light the pupil grows larger (dilates) to allow more light in. The retina lines the inner surface of the back of the eye. There are millions of photoreceptors, called rods and cones, in the retina which capture the rays of light. Light falls on the retina, the photoreceptors turn them into electrical impulses that trigger nerves and are sent to visual areas of the brain through the optic nerve. Rod cells are photoreceptors in the eye, one of the two types of light sensitive cells in the retina. There are approximately 125 million rods in the outside of the retina and these work best in dim light and are used for peripheral and night vision. The sclera is the white part of the eye – a thick, tough, protective layer covering the entire eyeball. It prevents the eyeball from being injured and helps it to hold its shape. There are muscles on different points of the sclera enabling the eye to move in different directions. Vitreous gel is a clear gel that fills most of the inside of the eyeball. The gel ensures the eyeball holds its spherical shape and maintains the pressure of the eye. The gel holds the retina in place.